It’s January and who isn’t afflicted by the organizing bug? As a kitchen organizer, I can tell you that a friendly, manageable kitchen environment is key to healthier, tastier meals, so please follow through on those organizing urges! But this New Year, how about putting some fun and laughs into a task that’s usually counted among the grim and tedious. 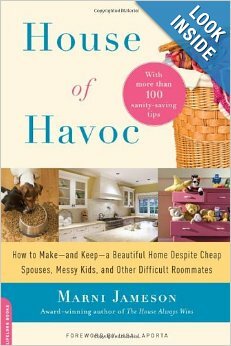 House of Havoc by Marni Jameson offers a warm and witty perspective on organizing that’s sure to keep spirits high while slogging through piles of clutter. Be sure to check out the chapter titled “Your Kitchen Is Under Arrest,” (doesn’t that tell all!) where Marni recounts her kitchen organizing session with Yours Truly. Special Offer: Marni has graciously provided an extra copy of her book that I’m giving away to the first reader to claim it. Besides great organizing advice, the book offers excellent design tips and tricks as Marni is also a home design expert. I think you’ll enjoy it immensely.